Data transformers are used to translate the data for a field into a format that can be displayed in a form (and back on submit). They're already used internally for many field types. For example, the DateType field can be rendered as a yyyy-MM-dd-formatted input textbox. Internally, a data transformer converts the starting DateTime value of the field into the yyyy-MM-dd string to render the form, and then back into a DateTime object on submit. When a form field has the inherit_data option set to true, data transformers are not applied to that field. If, instead of transforming the representation of a value, you need to map values to a form field and back, you should use a data mapper. Check out When and How to Use Data Mappers. Internally the tags are stored as an array, but displayed to the user as a comma separated string to make them easier to edit. Say you have a many-to-one relation from the Task entity to an Issue entity (i.e. each Task has an optional foreign key to its related Issue). Adding a listbox with all possible issues could eventually get really long and take a long time to load. Instead, you decide you want to add a textbox, where the user can enter the issue number. That's it! As long as you're using autowire and autoconfigure, Symfony will automatically know to pass your TaskType an instance of the IssueToNumberTransformer. For more information about defining form types as services, read register your form type as a service. If you're not using autowire and autoconfigure, see How to Create a Custom Form Field Type for how to configure your new IssueSelectorType. 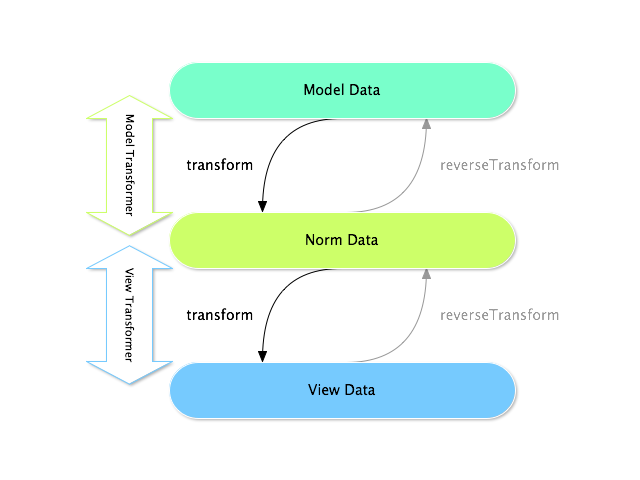 transform(): "model data" => "norm data"
reverseTransform(): "norm data" => "model data"
transform(): "norm data" => "view data"
reverseTransform(): "view data" => "norm data"
To use the view transformer, call addViewTransformer().